A good daylighting strategy can help you achieve a brighter, more comfortable, and energy-efficient home. Natural light can do wonders in defining your living spaces, while improving visual comfort. It also helps in cutting down energy costs. In this second installment of our two-part blog, Renewal by Andersen® of St. Louis, your expert in windows installation in St. Charles, MO, discusses some tips on incorporating daylight into your home. Depending on your home’s orientation, some of your rooms can benefit more of the available daylight. Since living rooms, dining areas, and bedrooms are usually larger and deeper, the increased light entry helps maintain a consistent light level and results in better visual comfort. Strategic window placement is also a priority in daylighting. On your next , take note that south-facing windows supply steady daylight. North-facing windows admit soft, indirect light. East- and west-facing windows optimize sunlight in the morning and afternoon. By pulling curtains and shades up during the day, you can maximize light entry. We also recommend painting the room with white or other light colors to reflect natural light that comes in. Mirrors across from a window can also help scatter sunlight in a room. You can control glare by choosing our St. Charles, Missouri, energy efficient windows, which feature High-Performance Low-E4 Sun™ glass. This allows natural light entry, while keeping the indoor temperature consistent. To ensure even light, we recommend placing light sources as high as possible. This allows the light to reach deeper into interior spaces. Placing windows in two different directions also permits sunlight to get to all corners of the room. By replacing your outdated or drafty windows, you can get the most out of the benefits of daylighting. We have a variety of windows that can maximize available lighting in your home. For example, our picture and casement windows in St. Charles, MO, feature slim frames and expansive glass areas. They can help you keep a warm and inviting home, minus the costs for electric lighting. The key to a successful daylighting plan is finding the right balance between your home’s architectural design and lighting strategies. 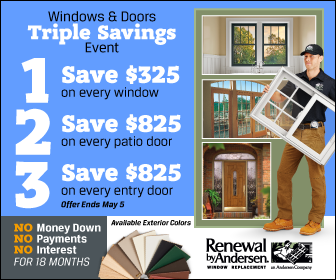 At Renewal by Andersen of St. Louis, we will carefully study how light enters your home, so we can come up with great locations for your replacement windows. Be sure to check part one of this two-part blog to know more about the benefits of daylighting to your home. Call us at (314) 332-2364 to start on your daylighting project. You can also complete our form to request a FREE in-home estimate.